I was homeschooled from class V onwards by my mother. It was a stress-free and enjoyable experience which is why I have decided to homeschool my three children. Unfortunately the mainstream education system hasn’t changed since I was a child. It is too straight-jacketed and oppresses the creativity and natural curiosity of children. The biggest advantage of home education is that you can tailor-make study programmes and pedagogies to suit each child’s learning style. Children also have the freedom and flexibility to choose their subjects of study. Most importantly it teaches children to take responsibility for their own learning. The popular public perception of homeschooled children seems to be that they are super-gifted nerds inept at developing social and peer relationships. This is untrue. Homeschoolers are normal children who love meeting and playing with friends. In fact the flexibility of their schedules allows them to meet friends frequently and participate in extra-curricular activities. But I must also warn it’s a lot of hard work — as one of the parents you quoted in the cover story said parents “have to combine the roles of principal, parent, teacher and counselor”. I was quite disappointed by the March cover story which gave a one sided view of homeschooling in India. Moreover my quote is totally distorted. It says exactly the opposite of what I meant to say. I agree with Sandhya. What I said and what was finally published in your magazine is a totally different version. Not acceptable! 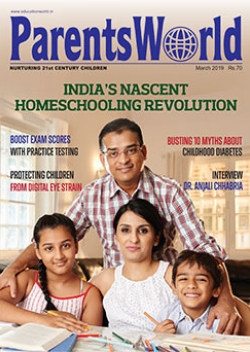 I read your cover story on homeschooling (PW March) with interest and was surprised with the growing number of Indian parents opting to educate their children at home. The formal schooling system has been tried and tested for centuries. I think it’s being unfairly ridiculed and criticised. The world’s greatest leaders, entrepreneurs and educators have graduated from formal schools. For many parents including myself, helping children with their homework is more than enough homeschooling. Children need to learn to fend for themselves and we are not helping them by being over-protective, molly- coddling and indulging them at home. Parents are not the sun around which children should revolve. By opting for homeschooling, parents are doing their children a big disservice. Thanks for the useful and insightful story on practice testing (PW March). Most parents are so busy sending children from one tuition class to the next that they almost never give them time to assimilate their knowledge and test it. As your story rightly highlighted, when children take practice tests they are able to retain and recall information more easily. Fortunately today there are numerous websites offering practice test papers and mock questions for CISCE, CBSE and state board exams. You need to enhance the magazine’s Academic Advantage section to include more tips and guidelines to help children maximise their academic potential.